We are a web firm that specializes in design, eCommerce, Content Management (CMS), Site Architecture, Workflow Automation, Usability & Accessibility Analysis, Search Engine Optimization (SEO) & Analytics, Branding & Identity, Logos, Print Collateral, and Photography. Ryan has an extensive background in traditional and interactive media. Ryan graduated from Ryerson University with a bachelor of fine arts in photographic studies. He then completed his post-graduate studies in Web Design at the Sheridan Institute of Technology. Finally, Ryan has a master's from McMaster University in Communications and New Media. Training in both online and offline media provides Ryan a vast understanding of every aspect of your design needs. Corey has an extensive background in software and problem solving. As a graduate from the University of Waterloo with a double major in Computer Science and Combinatorics & Optimization, Corey has the theoretical background to back up his practical skills. 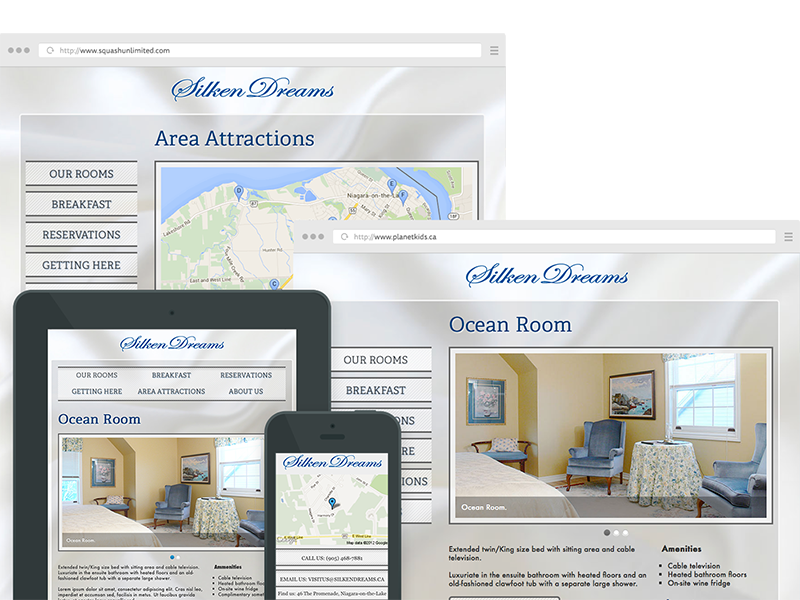 Silken Dreams needed a site that adjusted to the screen size of their guests, creating an experience that worked whether they were on a desktop, tablet, or mobile computer. Planet Kids needed parents to register their children into the 60 different summer camps offered. We needed to come up with a shopping cart that could accommodate this massive process, and it had to be quick and painless. Squash Unlimited needed to make their site more user-friendly. We took their existing database and designed in a new front and back-end. We retooled everything, right down to the logo. 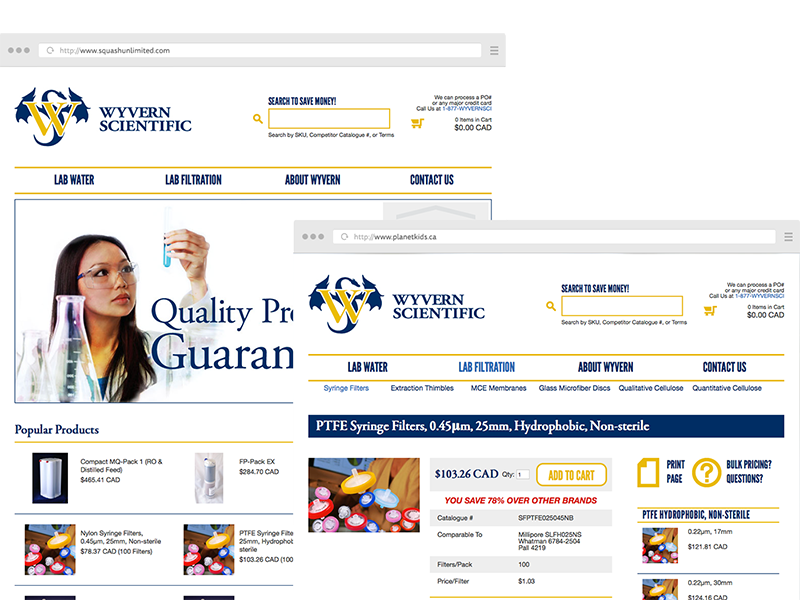 Wyvern Scientific needed a way to sell their products to labs outside of business hours and provide scientists and technicians with the specifications for their products. We created a simple to manage CMS and eCommerce system to get the job done. Full of Design have worked for clients such as various organizations at Ryerson University, Sheridan College, and the University of Waterloo, including Faculty Associations, Sports and Recreation departments, and student unions. They have also worked with large clients like Planet Kids, Ontario's largest privately owned summer camp, and The Eyeopener, Canada's most award-winning student newspaper. Their non-profit experience includes the Association for Science in Autism Treatment (ASAT), the Victorian Order of Nurses, and Willow Breast Cancer Support and Resource Services. If you would like an estimate for your next Web project, please get in touch! We're happy to discuss how we can design the site you need and want.